What can New York expect of its next music director? 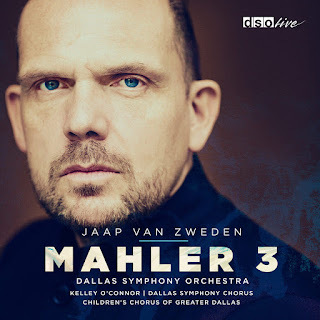 Jaap van Zweeden’s recordings can be counted on your fingers and most are – like this release with the Dallas Symphony – live concerts. Mahler’s third symphony is a large and unwieldy piece with a mezzo soloist and women’s and children’s choruses, a test of organisation for any conductor before he or she can begin to think about interpretation. On first hearing, this performance is efficient and attractive with sustainable speeds and some fetching solos from the concertmaster, Alexander Kerr. The vocal soloist Kelley O’Connor lacks heft and any dimensiom of the ominous in her Nietzschean admonition but that may be a balancing fault in the hall rather than a conductor or singer shortcoming. The choirs do their bims and bams with every possible display of enthusiasm, and then some. It takes a second hearing to determine what’s missing. In a word: character. Van Zweden takes a pace so safe that he struggles to introduce any kind of individuality to the shaping and phrasing of the 90-minute work. Everything is present and correct and there’s nothing out of the ordinary. Nor is there any sense of Mahlerian irony and ambiguity, the possibility of worlds beyond the literal score. By the time you reach the finale – the first of Mahler’s great adagios – it feels like you’ve taken a long hike and got absolutely nowhere that you want to spend the night. In the great roll of Maher 3 albums – Kubelik, Horenstein, Tennstedt, Abbado, Chailly – this does not pass my audition test. New York, I fear, could be in for a dull half-decade.